On July 6, 2016, Gannett, the nation's biggest newspaper chain, paid the Borgs $40 million for North Jersey Media Group (The Record of Woodland Park, Herald News, NorthJersey.com, (201) magazine and 50 weeklies). Stephen A. Borg, publisher for a decade, oversaw the biggest downsizing ever. Local news declined, errors mounted and most employees were denied raises. Gannett replaced Editor Deirdre Sykes, revised The Record's website and redesigned the print edition, cutting another 350-plus jobs. Sign pollution at an auto service center and gas station on Forest Avenue and Teaneck Road in Teaneck. Editor's note: This post has been updated to include a Star-Ledger editorial that condemns Governor Christie for killing a bill that would have boosted the turnout of voters in New Jersey. There was little if any mention of Governor Christie this morning on such National Public Radio stations as WNYC-FM. But his comments in the so-called Republican undercard debate on Tuesday night leads The Record's front page today. Political columnist Charles Stile continues to bore readers to tears with his endless analysis of Christie's every word, burp and fart -- as if the reporter sees himself as a patron saint of lost causes (A-1). Even calling the GOP bully "presidential candidate Chris Christie," as St. Charlie does, is a stretch, given he didn't even poll the 2.5% he needed to get on the main stage with Dr. Ben Carson and Donald Trump. Readers can expect Stile, Editor Martin Gottlieb and other Christie apologists to push for a comeback after the governor goes down in flames at the Iowa caucus and New Hampshire primary in February. Until then, it will be Christie on the campaign trail 24/7, and repeated backing of every veto in New Jersey. Shame on Editorial Page Editor Alfred P. Doblin for praising Christie's veto of early voting, automatic registration at Motor Vehicle Commission offices and other Democracy Act attempts to boost turnout (A-16). Again, Doblin and other editors continue to politicize every issue by calling greater access to voting an exclusively Democratic concern. "Voting is a responsibility," Doblin scolds readers turned off by the partisan politics that fill The Record's news columns. "A little effort is not asking too much of any citizen. Christie got this one right." A little effort isn't asking too much of a so-called journalist like Doblin, either, especially in view of unprecedented voter apathy and low turnouts in state and local elections. "New Jersey just had the lowest Election Day turnout in its history – with just one out of five voters bothering to show up – so the governor figures he might as well make it harder for people to vote. "His veto of the Democracy Act Monday was another predictable strike in Gov. Christie's campaign for voter suppression, and he even dusted off some old chestnuts about unreasonable costs and how the bill failed to "ensure that every eligible citizen's vote counts and is not stolen by fraud." "It's always amusing when politicians imply that voters cannot be trusted. "And it's special when a politician who spent $12 million on a special election – in a shameless attempt to hide from the electorate – claims he's looking out for our wallets." 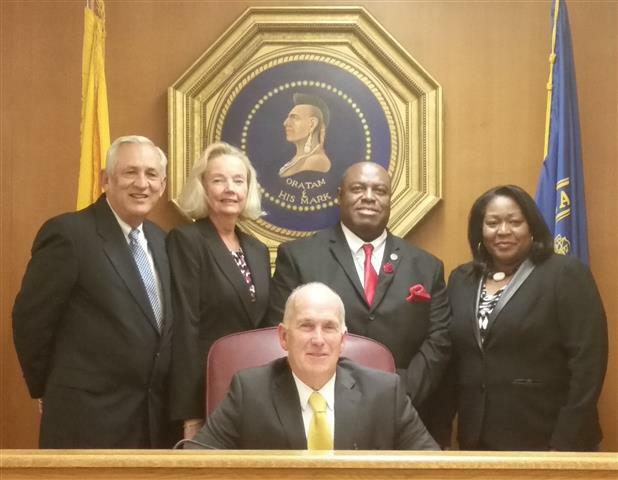 In a special nonpartisan election in Hackensack on Nov. 3, only 2,625 votes were cast for four council candidates -- this in a city with about 20,000 registered voters. One 90-year-old resident did make the "effort, but complained the entrance to his polling place at Hackensack High School was poorly marked, and he had to circle the large building to find it. Of course, The Record's lazy editors did their best to ignore local races in Hackensack and other towns, and the irresponsible Doblin didn't even issue any endorsements for those contests. Today's front page offers nothing to local readers in Bergen County, and if you turn to the local-news section, municipal reporting takes a holiday (L-1). Crime and court news apparently crowed out any mention of Tuesday night's meeting in Hackensack, where teacher's assistant Deborah Keeling-Geddis, who is African-American, was sworn in as a city councilwoman. Assemblyman Gordon Johnson of Englewood officiated at the swearing in. The Bergen County clerk certified the election of Keeling-Geddis to an unexpired term on Monday night, giving her a total of 819 votes. Incumbent Jason W. Some received a total of 784 votes, school board President Jason S. Nunnermacker got 756 votes and Richard L. Cerbo received 266 votes. Those totals are of votes cast on machines, mail-in ballots and provisional or paper ballots. If you want your comment to appear, refrain from personal attacks on the blogger. Anonymous comments are no longer accepted. Keep your racism to yourself.